Toronto startup Interaxon has landed its first venture capital infusion just months before it will launch its thought-controlled computing headset on the consumer market. No official announcement has been made regarding the funding, but anevent moderator inadvertently let the cat out of the bag by making apassing mention of the deal during a presentation by InteraxonCEOAriel Garten at today’s Mesh marketing conference inToronto. Garten confirmed in an interview after her speech that “a significantfunding event” has occurred at the company, but declined to givefurther details including the dollar amount, when it was raised or theinvestors involved. She did confirm that it’s the first VC Interaxonhas ever raised, saying the company has been “fully self-funded” untilnow. 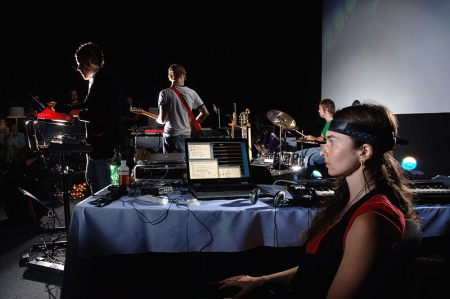 Interaxon CEO Ariel Garten, seenhere using brain-computer interface during a 2007 musicalcollaboration, says the next frontier in thought-controlled computingwill deal with emotions and self-awareness. A simple Google search appears to confirm that the financing came fromff Venture Capital based in New York City. The VC firm’s Web site listsInteraxon among the portfolio companies it has invested in, thoughthere’s no news release or other related details about the deal on thesite. FFVC (ff stands for “founder friendly,” according to a past Webinterview with the firm’s partners) closed its second VC fund lastNovember worth $27 million. According to a TechCrunch story posted inFebruary 2012, the new fund had already invested in 23 startups andplanned to put money into a total of 30 by the end of this year. That February story didn’t mention Interaxon as one of the 23 startupsthat received money from the new ff VC fund, so the Toronto companypresumably worked out a deal with the FFVC team within the past fewmonths. FFVC was one of the earliest investors in Klout, the site that measuresthe influence of social media users. The VC firm also invested$525,000in Toronto company 500 px (pronounced‘500 pixels’) in June 2011.500px’s photo sharing site has grown from 1,000 users in 2009 to290,000 users and 7 million monthly visits as of December 2011. Thestartup was a resident of Ryerson University’s Digital Media Zoneincubator before moving to its own office elsewhere in downtownToronto. Interaxon’s first VC deal comes at a critical time for the company.Interaxon plans to bring its first brain-computer interface (BCI)headset to the consumer market in about eight months, Garten toldITBusiness.ca following her Mesh presentation. It will be priced “sub$200,” she said, and target a market beyond BCI devices that simplymove or control objects using brain activity. “The application will be (a) mass consumer one…that helps you understand and deepen the self,” Garten said. That theme was the cornerstone of her Mesh talk. Companies like MattelInc. have literally made BCI into child’s play with toys like the 2009MindFlex headset, which uses brainwaves to move objects like a pingpong ball. And Interaxon showcased its own BCI technology during the2010 Vancouver Olympics by allowing thousands of people across Canadato control lights on the CN Tower, the Parliament Buildings and NiagaraFalls with nothing but their minds. But Garten said Interaxon’s new headset will use brain activity to helpusers track their thoughts and emotions so they can become moreself-aware, understand themselves better, and change their environmentaccordingly. Users can know not just when they’re overtired, anxious,happy or angry, but also what triggered those brain responses so theycan modify their relationships and home or office surroundings asneeded. Some of that can already be automated, she said, like soundsystems that play certain songs – sad, upbeat, soothing, etc. — on auser’s iPod based on what kind of mood they’re in. The next frontier of BCI is “technology that’s not technology fortechnology’s sake but there to support our human emotions andinteraction,” she added. Garten predicted we’re probably 15 years away from the averagehomeowner having a house that can fully adjust its automated functionsbased on their brain waves.